The universe is comprised of the two fundamental ideas of creation and destruction. They are the essence of all societies, and while many think they are polar opposites and completely detached from each other, I strongly believe that they can be seen as two sides of the same coin. In truth, every creation is preceded by a state of destruction, and every destruction is preceded by some order of creation. Cultural shifts throughout the world clearly show that during periods of oppression and destruction within societies, ingenuity and creation begin to emerge and eventually provide a richer, more prosperous culture. My own South Asian community is a prominent example of the correlation between these two ideas and how the eras of ruin and hardship result in more unified and culturally active countries. For instance, when thinking about these different ideas, I am first drawn to the various accounts I have heard from my elders about their perilous journeys during the partition of India and Pakistan. Tragic stories of migration, separation, and displacement are quite well known to my entire family. As a Canadian Muslim, I am often given multiple accounts from family members about the sudden departure, loss of homes, and oppression that erupted as a result of the partition of India and Pakistan. My grandparents would recount grim memories of being separated from their friends and families as entire communities around them began to disintegrate. Their journeys began on August 14th, 1947, after a nationalist struggle in the Indo-Pak region that lasted nearly three decades, which resulted in the creation of two different states: Pakistan and India. This was a very critical point in history that marked the end of European empires and the start of the postcolonial era. Cultural and religious tensions between the Hindus and Muslims erupted and led to one of the largest mass migrations in history, riots, a harsh division between communities, and the death of many civilians. It wasn’t until I grew older that I slowly began to recognize and understand the gravity of these events and the level of suffering and oppression that the two nations had gone through. When I was 14 years old, I was able to grasp the interconnection between periods of destruction and freedom of expression and creativity when I attended an art exhibit in Pakistan. There I discovered an artist named Sardari Lal Parasher who examined the correlations of power and national identity arising from the historical event of the partition. At the age of 43, Parasher was forced out of his home and into the newly created territory of Pakistan. During this period, he made several sketches of the refugee camps surrounding him. When examining Parasher's paintings, I was extremely shocked and appalled by the gripping quality of the emotions of grief and despair that he had depicted amongst the refugees. The painting, “Strokes of Anguish,” shows the sadness of a young refugee sitting in a corner with his head facing towards the ground and his arms wrapped tightly around his body as he reflects on the loss and sorrow he has experienced. Through his artwork, Parasher was able to visually document the agony and horror as a result of the partition. By attending this exhibit I gained more insight into the clear connections between creativity and division within all societies and cultures. I began to realize that after periods of oppression and suffering, individuals display resilience through artistic expression. I was also exposed to these same ideas in relation to current global issues at the Penticton Art Gallery in British Columbia. There I saw “Behind the Lines,” a collection of works portraying the reality of living amongst the destruction and devastation in Syria. 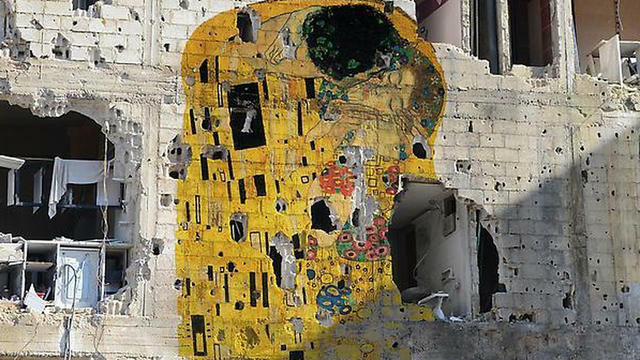 The Syrian artists were able to channel their emotions and feelings towards oppression, and affirm the incredible capacity of the human spirit to not only survive the most unimaginable circumstances but express itself through meaningful forms. This display of various styles of artwork provided insights into global images of suffering. For example, the “Cultural Beheading” series, by Rami Kakhos and Humam Alsalim, featured recreations of different statues from the ruins of the religious site Palmyra in Syria, which had been destroyed by radical groups. These attacks had deprived the country of its identity, knowledge, and history, and the artists used bright crimson paint to symbolize the systematic massacre and subsequent loss of Syrian cultural diversity. However, the exhibit clearly showed that despite any obstacles the nation faced, Syrians were able to band together to show that no one can silence their history or culture. Artists were able to use the ruins of Palmyra scattered throughout the ancient world to create a project that raised awareness about the country’s struggles. Collectively, these experiences taught me that there is a clear relation between all forms of creation and destruction. During periods of complete devastation and persecution, art provides a powerful medium of expression and rebellion against authorities. As Charles Bukowski once stated, “The way to create art is to burn and destroy ordinary concepts and to substitute them with new truths that run down from the top of the head and out of the heart.” This clearly illustrates the universal link between these two elements and shows the artistic ability to renew society after periods of chaos and havoc. I strongly believe that creation presupposes destruction and destruction foreshadows creation, and the rift between them forges new artistic expression. Ameena Naqvi is in the 10th grade at Arbour Lake School in Calgary, Canada. Her hobbies include drawing, playing the flute, and reading. She has a passion for music and writing.